Eggless Sprinkle Cookies with step by step photos. The colorful sprinkles added to the cookies will not only bring in more colors to your cookie bin but will add to the festive spirit around Christmas time. It has been my long time wish to bake these sprinkle cookies and finally baked these cookies as eggless ones. Do excuse the clicks as they were taken very late in the evening. My oven has been behaving naughty off late and I’m sure its going to give up on me soon. Even while I was baking these cookies it stopped in the middle and I had to wait for some time till it started once again. I have used just the basic colored sprinkles while you can use heart shaped ones or mini balls that you get at the store especially during this season. Its very easy to make and uses only the ingredients that are already in your pantry. So bake these off right away and enjoy these cookies along with your family and friends. 1. In a bowl mix together flour, baking soda and salt. 2. In a mixing bowl beat butter well. 3. Add both the sugars and beat till fluffy. Add vanilla extract and beat once more. I used my hand mixer but you can also do this with a whisk. 4. Add flour mix in batches and gently mix. It will resemble bread crumbs. 5. Now add colored sugar sprinkles and mix well. If you make a ball from the dough, it should hold its shape well. 6. Cover the bowl and refrigerate it for 1 hour. 7. Preheat the oven @ 180 C. Make small ping pong sized balls from the dough. 8. Arrange on a baking tray leaving 2 inch space between the cookies. Alternately instead of making balls, you can also use cookie press to pipe out the dough in different festive shapes. 9. Bake for 15 mins. Remove the tray and let it cool for 2 minutes before removing to a wire rack. Store in an airtight jar. 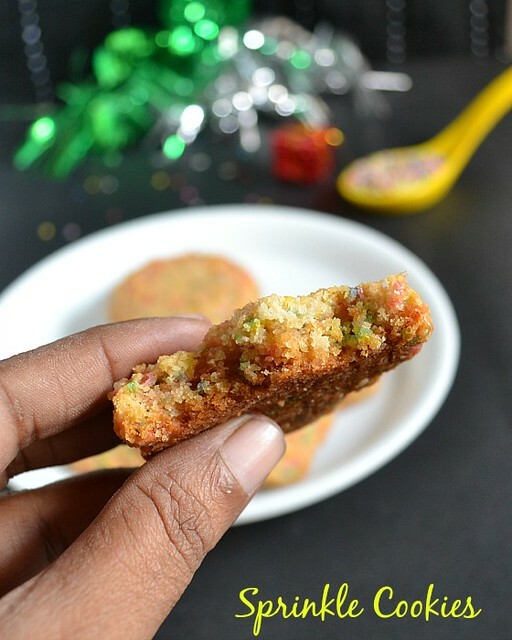 Eggless Sprinkle Cookies with step by step photos. In a bowl mix together flour, baking soda and salt. In a mixing bowl beat butter well. Add both the sugars and beat till fluffy. Add vanilla extract and beat once more. I used my hand mixer but you can also do this with a whisk. Switch to a spatula. Add flour mix in batches and gently mix. It will resemble bread crumbs. Add colored sugar sprinkles and mix well. If you make a ball from the dough, it should hold its shape well. Cover the bowl with a cling wrap and refrigerate it for 1 hour. Preheat the oven at 180 C (350 F). Take the bowl out of the fridge. Make small ping pong sized balls from the dough and arrange on a baking tray leaving 2 inch space between the cookies. Alternately instead of making balls, you can also use cookie press to pipe out the dough in different festive shapes. Bake for 15 mins. Remove the tray and let it cool for 2 minutes before removing to a wire rack. 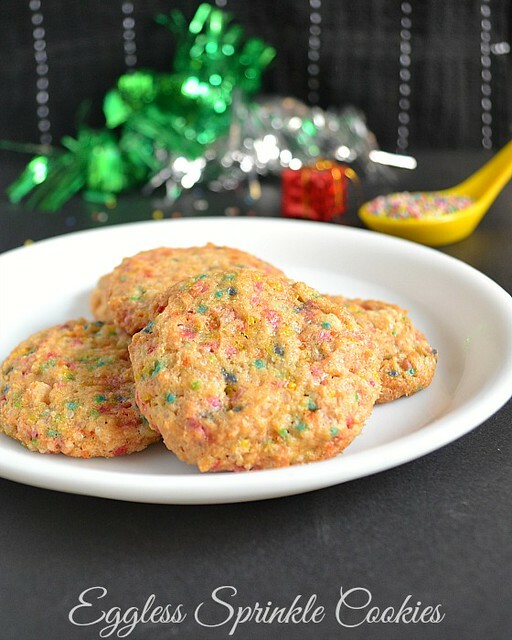 Store these eggless sprinkle cookies in an airtight jar. Vegan Chocolate Cookies Recipe - Gluten Free too !!! Super cute cookies.Good u have addded less butter. shall try this sometime !